So I've spoken with the Zelda mods and we've decided to re-open this thread for now. This is conditional to continued good behaviour from members involved. I will outline some guidelines the mod team is looking for from the community. This post will be edited into the OP so that it is easy to reference. The title of the thread will also ask new posters to look at the OP so that no one misses it. If there is a large fight again within this thread, we will be closing it. Isolated incidents - so something between two users - will not result in thread closure. In the event this happens, the mod team will create a new thread subject to similar guidelines in a few days to give members some time to calm themselves, in the hope that a new thread will help to reset relations between users. We are looking for this thread to become a civil environment. We should not be mocking one another nor should we be rude to one another. If someone is frustrating you or you think they're breaking the rules, bring it up with a moderator or myself. We'll handle the situation for you from a position of clarity. Let's avoid having anyone get into anymore trouble if we can. If anyone has any questions or comments regarding this, please feel free to PM me. I just had a word with my Z mods and we discussed the current state of this thread. I get what they've been trying to achieve because it's their job to make sure things stay on topic, and that things are split off appropriately when needed, right? Please don't hold this against them as this is literally what they are hired for here, you know? That said, after looking through this I basically told them that perhaps we've been going about this wrong. It seems like the Z community have chosen a hub in which they have general chat, and this is a good thing! Other areas on ZU have it; the GCC has a chat thread, the SD has the War Room, the RPG has the OoC, all 3 clans have their own chat threads, and each of these are cornerstones to building their communities. So I said maybe the Z community have chosen where they'd like to build their own community, and it's this thread. The General Z thread was pointed out to which I said if it's dead and everyone's here, then I think it's pretty clear which thread people prefer, and the mods heartily agreed. So! With the hope that this thread will continue to help grow and maintain the Z section because, truth be told, the Z section doesn't have a central hub where people can congregate and be a community under a common interest, we're hoping this thread will be it. Instead of pushing the rules so hard, we'll try a bit of community-fostering instead and allow this thread to flourish as a general chat for Zelda U news/rumours, and see how that goes. THAT SAID, like the other chat threads, if people end up going for a few pages about a specific topic and it ends up stifling the talk of others, it will prob get split off to its own thread, though I imagine with this becoming an official chat thread for this stuff, that won't be as frequent as it has been. Also, again, I wanna emphasise that my mods aren't here to make your lives miserable and if you felt that's been the case, then as temp-Head Admin, I apologise sincerely and hope you'll be able to understand that they've just been doing their best to maintain these boards. Don't be so hard on them <3. Alright! Gonna reopen in a few minutes after I edit thread titles and lock down other threads that are no longer needed. -Malia and the Z mods. A whole New World Discovered In The Legend Of Zelda! The post was edited 16 times, last by KingOfHeart ( May 5th 2016, 3:58pm ). Just imagine how much crazier we will be in a few months time though, if they show an awesome trailer like the one for Twilight Princess haha. The post was edited 1 time, last by Red Falcon ( Mar 27th 2014, 5:51am ). Yeah, but we won't like it if it winds up being a bust - ala the DKCTF reveal for when everyone was amped up over Retro's Super Secret Awesome Game That They Kept Not Showing For A While. Or maybe E3 2008, when everyone got to sit around and watch Miyamoto play Wii Music. I'm going to consider it a massive disappointment regardless if the reveal doesn't have Riders of Steel. Me too, me too. I didn't buy a Wii U for nothing, did I? I don't really know why, but I have such huge expectations for the upcoming Zelda game. I think we'll be seeing non-linearity, which I'm excited about, as well as a new artstyle, which I can't wait to be revealed. I hope it looks like a high definition version of Ocarina of Time. I do hope they release a trailer soon. The post was edited 1 time, last by ZeldaCompilations ( Mar 27th 2014, 3:17pm ). ...or Skyward Sword's reveal. Goodness, never had I felt so deflated by a Zelda reveal. I really hope they learned from that this time around. Our last chance will be the next nintendo direct on april. *If* there will be a Direct in April...after all, there wasn't one in January or probably March. We had one on december , one on February and surely there will be one on april before the one from tbe E3 on June. I am also going very crazy.. BUT at the same time I'm not expecting any news before e3. Too many times I've had a "feeling" it would be revealed and nothing happens. Hyrule Warriors being revealed pretty much confirms we won't be hearing anything till e3 since I doubt they would choose to announce two Zelda games fairly close to each other in non e3 events. I think we should all just forget about hearing anything till e3. But I hope the long wait will be worth it. It was in January 2013 they confirmed it was in development, in e3 2013 it was nearly shown, then later in the year Aonuma mentioned preparing something to show us. Why didn't they just keep quiet if they knew we would be waiting more than a whole year to see any footage?? And this is officially the most I'm looking forward to a new Zelda game reveal. Usually I can sorta control myself but I blame Aonuma and all his talk of how we should look forward to "unexpected elements" and a Hyrule in "a setting like we will never expect", the very possible seamless overworld we will be getting like in WW. And just using WW's great sea exploration as inspiration which is the BEST Zelda overworld in my opinion. Not to mention the "unique" art-style that will use the capabilities of the Wii U to its fullest. So Nintendo you better blow me away or else.. I'm actually glad that Nintendo did not reveal much at all about Zelda U. We have nothing to get hyped about because we truly don't know anything. They are so far playing the hype game the right way. We could use maybe an interview or some leaked concept art around April, and some information during E3 as well.. I'm pretty patient when it comes to not having any news on Zelda U before E3. Hopefully it'll look fantastic when they do show the first trailer of it during that time. I do believe Nintendo is playing it smart for holding it back instead of giving us the full package like when TP was announced. But at the same time I think it would be cool of Nintendo could release some sneak-peak concept art before E3 just to get things started and to get the rumors flowing again. I may not be hyped, but I'm certainly frustrated. Nintendo's situation as a whole does not leave me tolerant of long and complete silences. Teasing and blowing people away with a big reveal is generally the best selling point. And honestly? I find it good in a way that they're staying hushed on it, more time to work on development. I'm really hoping the game will be awesome with all the time it's taken thus far. But at the same time I think it would be cool of Nintendo could release some sneak-peak concept art before E3 just to get things started and to get the rumors flowing again. I find it good in a way that they're staying hushed on it, more time to work on development. I'm really hoping the game will be awesome with all the time it's taken thus far. Do you guys remember piece of concept artwork? 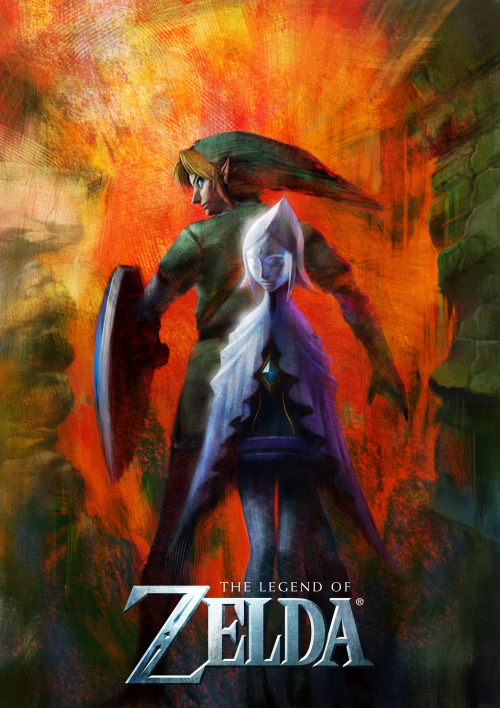 This, my friends, was a promo "teaser" poster of sorts that was released YEARS before Skyward Sword was even announced at E3. It was pretty much just a teaser for a Wii Zelda, with only Link and Fi on the cover (however, we didn't even know who she was at the time, not even her name; like I said, a teaser image). I remember when the image was fist shown in an issue of Nintendo Power years ago. The problem with showing little things like this is that things change by the time the game is released. And you can definitely tell when you compare this poster to the final game that we now know as Skyward Sword was released. I mean does that image above ^^^ look anything like THIS? Not really, as the teaser image was somewhat going for the more TP-art style and not so much for the TP-and-WW-had-a-mutant-child-together style. Some fans were excited, but a few were disappointed as well, primarily the ones that were excited to see a game in the style that the poster showcased. So yeah, it would be nice to see some form of teaser poster or something to generate a bit of excitement, but at the same time, I feel Nintendo should hold back from that so as not to disappoint their fans by giving them a teaser for one game and giving them something ENTIRELY different by the time the game is released in a few years. And we ALL know it's not the first time something like that's happened. I don't think I have to elaborate on the showcasing of the GCN Zelda game that looked like Ocarina of Time but ended up being the cartoony WW when it was released. Either way, it's too early right now for Nintendo to start releasing teaser stuff. I say they should wait until they actually have a concrete idea of what game they're making and that way we don't have some fans getting severely disappointed and starting riots when a totally different game is released. That's just setting fans up for disappointment and leads to poor sales and reception. The post was edited 2 times, last by death. ( Mar 28th 2014, 12:22am ). Good point on not releasing screenshots, but a simple vague interview will just keep me satisfied for at least a month. Hmm, yeah, an interview would be nice Just to see what kind of ideas they've got floating around and it could give us something to discuss. We'll just have to see what comes out in the next few months. I'm not sure when they plan on having the game released though. I can't imagine it will be released this year, unless they rush the release for Christmas or something (which they'd better not do because they should know by now that rushed releases for Xmas never turn out well) but 2015 would be the ballpark year they'd release it so who knows, we might see some stuff by the end of this year (hopefully). Maybe sometime over the spring/summer. Just don't want to see any screenshots/promo posters lol This early in development, everything could change in the blink of an eye x)"""
I honestly don't think they'll rush the release for 2014 when Mario Kart 8 and Super Smash Bros. 4 will be out in the same year. ...or Skyward Sword's reveal. Goodness, never had I felt so deflated by a Zelda reveal. 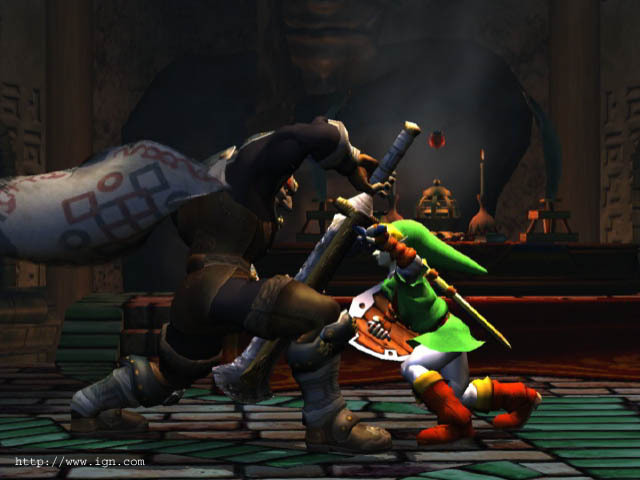 I played Skyward Sword without seeing the E3 videos. I've only just recently bothered to see the E3 reveal for Skyward Sword within the last couple of days. And my GOD!!! I'm not surprised you felt deflated. It was such an embarrassing reveal! They couldn't aim with the Slingshot, or the Bow, or kill the Deku-Babas with the sword. They "gave up" on demonstrating the Beetle. Not a good demonstration of the technology or gameplay at all. A shame, since I thought the actual game was very good. The post was edited 1 time, last by Red Falcon ( Mar 28th 2014, 7:44am ).